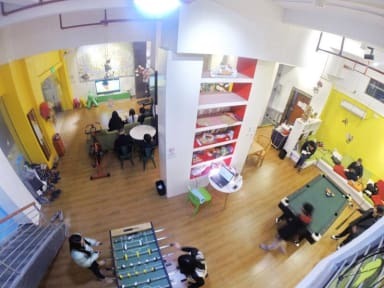 Lazy Gaga Hostel i Guangzhou, Kina : Boka nu! Yes it is cheap, but not clean at all. The staff was really helpfull because my room was not cleaned. The toilet had urin all over and the smell in the room was like a dead rat been laying there for a while. They gave me a new room that was clean and nice. The kitchen is very well equiped, and the place has a nice atmosphere. The neighberhood is a little bit rough.